Our website contains extreme content. Expect excessive profanities, violent images, sexual descriptions, and inappropriate references. If you are not comfortable with this, please leave immediately. If you are a minor, defined as anyone under the age of 18, you must not view any content in the NSFW section our site. The NSFW section is defined as any article located within WTFFlorida.com/NSFW/. We are essentially a nonfiction comedy site. Expect snarky and rhetorical writing. Expect bias. We do this to elucidate, albeit ridiculously, the fact that news media tends to manipulate and exploit the senses. We also write this way because it’s funny. At the end of the day, our intentions are good. We wish to unite Floridians and the world through laughter. Sometimes we have to be crude and ironic to express the truth, since our reality is often ugly and dichotomous. Don’t be so eager to get offended. If something we wrote made you really mad, we’re probably just joking. Or not. We all have differing opinions. Feel free to leave your opinion in the comments. We offer the ability for users to leave text comments on our website. We are not liable for any of the content our users post. Portions of this website contain unedited materials, some of which may be offensive, vulgar, sexual, and explicit. You access these materials at your own risk. WTF Florida has no control over and accepts no responsibility whatsoever for such materials. Should you choose to do so, your name and other information voluntarily presented will be publicly posted. By use of this system, you indemnify WTF Florida of any harm or action that results from your voluntary publication of said information. WTF Florida is not in any way whatsoever responsible for the appearance of any inaccurate, threatening or defamatory information, or for the use of the information contained in or linked from this website. Comments are strictly for the purpose of parody, and all content herein should be treated as such. The comments posted here are artistic works of fiction and falsehood. No legal action may be taken against a user for their comments. Anyone can choose any name to post with. WTF Florida makes no claim that the comment poster is who they say they are. We make no guarantee that your comment will not be modified. We make no guarantee that you will be able to edit your comment after posting. Comments cannot be deleted by users. We remove comments as quickly as possible that contains links to illegal content and viruses. Nasty, rude, offensive comments are generally not deleted. We are very permissive, but we may remove comments as we please for any reason. Our servers may record the numerical Internet protocol (IP) address of the computer you are using, the browser software you use and your operating system, the date and time you access our site, and the Internet address of the website from which you linked directly to our site. By use of this system you consent to such recordings. WTF Florida is not responsible for anything a user posts in the comments. The website and all data and information and/or content that you see, hear or otherwise experience on or through the website (the “Content”) belongs to WTF Florida, its partners, affiliates, contributors or third parties and may be protected by U.S. and international copyright, trademark, intellectual property and other laws, and belong to WTF Florida, its partners, affiliates, contributors or third parties. Third party content is intended to be used on this website in a legally-permissible manner; you may need third party licenses or permissions to use such content for other uses. do not modify or alter the Content (including source codes) in any way, or delete or change any copyright, trademark or other legal notice. No right, title or interest in any copied or downloaded Content is transferred to you as a result of any such copying or downloading, or as a result of your access to or use of any part of the website. WTF Florida reserves complete title and full intellectual property rights in any Content you copy or download from this website. WTF Florida cannot and does not guarantee or warrant that files available for downloading through the website will be free of infection by viruses, worms, Trojan horses or other code that manifests contaminating or destructive properties. The entire risk as to the quality and performance of the website, the accuracy of any information or content provided through the website, or quality of any file used in conjunction with the website is solely and exclusively with you, the user. YOU EXPRESSLY AGREE TO ASSUME TOTAL RESPONSIBILITY AND RISK FOR YOUR ACCESS TO AND USE OF THE WEBSITE, INCLUDING, WITHOUT LIMITATION, ALL SERVICES, CONTENT, FUNCTIONS AND MATERIALS THEREON. WTF FLORIDA MAKES NO EXPRESS OR IMPLIED WARRANTIES, REPRESENTATIONS OR ENDORSEMENTS WHATSOEVER WITH RESPECT TO THE WEBSITE. WTF FLORIDA EXPRESSLY DISCLAIMS ALL WARRANTIES OF ANY KIND, EXPRESS, IMPLIED, STATUTORY OR OTHERWISE, INCLUDING, BUT NOT LIMITED TO, IMPLIED WARRANTIES OF MERCHANTABILITY, FITNESS FOR A PARTICULAR PURPOSE, TITLE AND NONINFRINGEMENT, WITH REGARD TO THE WEBSITE OR ANY INFORMATION OR CONTENT CONTAINED THEREIN (INCLUDING THIRD PARTY INFORMATION). WTF FLORIDA SHALL NOT BE LIABLE FOR ANY LOSS OR DAMAGE ARISING EITHER DIRECTLY OR INDIRECTLY FROM ANY USE OF THE WEBSITE OR ANY INFORMATION OR CONTENT CONTAINED THEREIN (INCLUDING THIRD PARTY INFORMATION). IT IS SOLELY YOUR RESPONSIBILITY TO EVALUATE THE ACCURACY, COMPLETENESS AND USEFULNESS OF ALL INFORMATION OR CONTENT PROVIDED BY THE WEBSITE. WTF FLORIDA DOES NOT WARRANT THAT THE FUNCTIONS PERFORMED BY THE WEBSITE WILL BE UNINTERRUPTED, TIMELY, SECURE OR ERROR-FREE, OR THAT DEFECTS IN THE WEBSITE WILL BE CORRECTED. WTF FLORIDA DOES NOT WARRANT THE ACCURACY OR COMPLETENESS OF THE INFORMATION OR CONTENT PROVIDED BY THE WEBSITE, OR THAT ANY ERRORS IN THE INFORMATION OR CONTENT WILL BE CORRECTED. THE WEBSITE, AND THE INFORMATION OR CONTENT ARE PROVIDED ON AN “AS IS” AND “AS AVAILABLE” BASIS. You understand and agree that you are personally responsible for your behavior on this website and for your use of the Content. You agree to indemnify, defend and hold harmless WTF Florida, its subsidiaries, affiliated companies, joint venturers, business partners, licensors, employees, agents, advertisers, and any third-party information providers to the website from and against all claims, losses, expenses, damages and costs (including, but not limited to, direct, incidental, consequential, exemplary and indirect damages), and reasonable attorneys’ fees, resulting from or arising out of your use of this website or your use of the Content, any violation by you of this Agreement or any applicable law, or any activity related to your user account (including negligent or wrongful conduct) by you or any other person accessing the website through your user account. All are presumed innocent until proven guilty in a court of law. Every effort is made to ensure the accuracy of information posted on this website, however, WTF Florida does not guarantee accuracy or timeliness of the content of this website. Names may be similar or identical to another individual. Anecdotal details may be included that are not part of the police report, to elucidate Florida culture to outsiders, because that’s what separates us from other news agencies and makes this site fun. We are essentially a nonfiction comedy site, so expect some insulting and unconventional writing. All the articles in the “news” category are real incidents, and will include either a link to another news source and/or (a) direct quote(s) from the arrest affidavit. Hypertext links to third party websites or information do not constitute or imply an endorsement, sponsorship, or recommendation by WTF Florirda of the third party, any third-party website, or the information contained therein. You acknowledge and agree that WTF Florida is not responsible for the availability of any such websites and that WTF Florida does not endorse or warrant, and is not responsible or liable for any such website, or the content on such website, or the services offered by such website. Under no circumstances will WTF Florida be responsible for any loss or damage resulting from your use of any such website or the services offered by such website or any content posted on such website or transmitted from such website. Any links to other sites are provided for convenience only. You need to make your own decisions regarding your interactions or communications with any other website. We often create content that is satirical in nature, hereby declared as parody. The fair use of copyrighted works for purposes such as criticism or comment is not an infringement of copyright. See 17 U.S.C. § 107. We are not responsible or liable for anything. Our site has many anonymous administrators. No single person is responsible for the content on this site. We are protected by the First Amendment of the U.S. Constitution. SLAPP lawsuits (Strategic Lawsuits Against Public Participation) will not be tolerated. If a corporation or entity attempts to censor our site, we will ridicule them relentlessly. 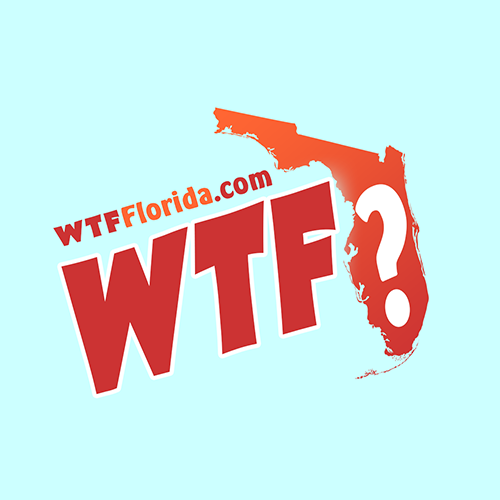 WTF Florida’s Copyright Agent for notice of claims of copyright infringement on or relating to this website can be reached by sending an e-mail request to wtf@wtfflorida.com or by using the contact page on our website. If you were offended by something we wrote, please consult your local therapist, or visit the Complaint Department.